In an earlier Blogpost I reminisced about the game Starquest. But travelling down nostalgia avenue, you can’t help but also stumble over its “sibling” Heroquest. Also published by Milton Bradley by the way. You play with 2 to 5 players, of which one has to be the dungeon master (D&D as a guideline to simplify matters?). You have a standard board, on which the dungeon master has to set up doors and cave-ins, according to the setup as prescribed in the manual. The players each have a Avatar. The game is set up to be played in a succesion of maps or levels (each one different from the previous one). With a simple start, each level gets progressively more schallenging, but the players also get the cahnce to upgrade their heroes in between levels. Movement and combat is doen with simple dice, and those characters able to use magic have a finite amount of magic cards which they can use (but cannot be replenished). The characters are the standard fare: a barbarian, a wizard, an elf and a dwarf. As with Starquest, you could get a number of add-ons which expanded the game with soldiers for hire for the heroes, magic and villains for the dungeon keeper, and more and varied missions and monsters to battle through and with. In our family we got our gifts and games quite fairly. 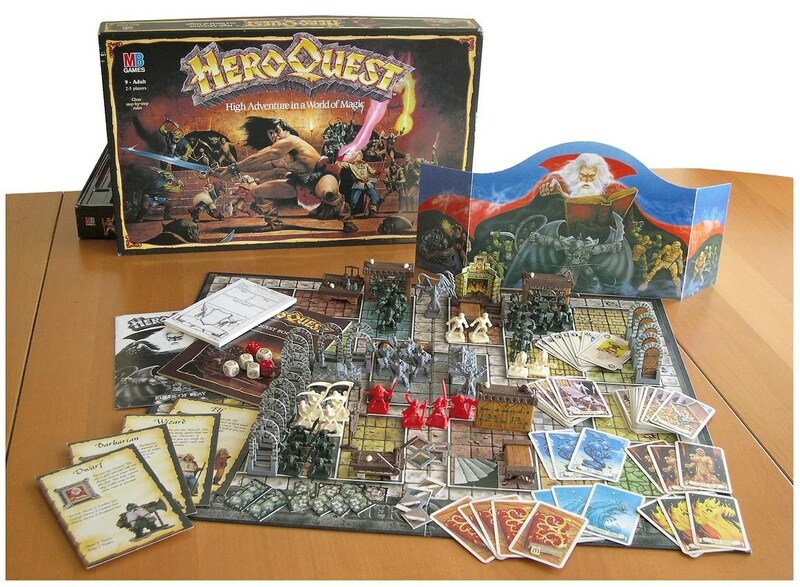 I had Starquest, my younger brother had Heroquest. Although it seemed we played Heroquest more often in the first few years after we got it. Whilst I obviously loved the science fiction setting of the game I had, it seemed to appeal to my imagination more thatn it did to my sense of actually playing it. Perhaps also because, if you played the game-master, the chances of you winning were quite small the further you progressed in the game. Heroquest, while also slightly suffering from this, played out faster per “level”. thus making it an easier game to get into and set up. You did not have the bleeps you had to move around. And especially in the beginning of the game, the models that were actually on the board were low in numbers. Meaning less moving around, and more actual playing (and more turns to do something!). For me, the game was great fun. Though it did not leave a lasting impression on me the way Starquest did (having flung me into the world of 40k), we did have quite a bit of fun when we played it as kids. I do highly recommend to play it with friends or family if you still have it. For some reason I stumbled upon a rehash of a board game: the Horus heresy board game. I was quite surprised there actually is a board game about the Horus heresy, all the more as it hasn’t been done by Citadel (seeing as they produce nearly everything Games Workshop churns out). Being the little google-Wikipedia-whatever sport, I clicked on and stumbled upon the previous incarnation of the game. With its accompanying artwork. And a wave of nostalgia struck me: It looked VERY familiar.My interest in warhammer 40k, and its expanded universe can be traced all the way back to a game based upon this game and universe: Space Crusade (or Star Quest as it was known in the Netherlands). Although it had been around for some time, it wasn’t until it hit the bargain bin that my interest was peeked. Well, to be fair, my family also didn’t have the budget to get it at its normal price, hence it wasn’t even a consideration till the price dropped. I loved this game. I remember hanging over the rule book and the tiny background book for hours on end. Reading everything, reareading it, and flipping the book over again. I studied the Space marine models for weeks. And I studied the box art on the sides of the box. Always wondering if I could ever imitate the way they had painted the models up. I played this game till the cards bent. Afterwards, a booster with new models came out, and ofcourse I had to have it. With a friend of mine we played this every time I came over. He even managed to crank out his own adventures to be played out. And so we extended the game play of the game by several weeks. The demise of the game in my interest corner started when I took the bold step of painting the miniatures. I didn’t have the expert model paint to do so, and with the thick Revell model paint (all you airplane model builders will know what I mean), I splashed on the cours as best I could. A few years back I re-examined the results. Lets just say, it wasn’t all that good. The second step was the fact I stumbled upon an expansion pack when I was on vacation with my parents in Sauerland (a region in Germany). It wasn’t known to us in the Netherlands, and I had to have it. But like all things kids want. The answer was no (and for good reason in hind sight). Could have, would have, should have, but the interest faded. Last but not least was the fact the local toy store started carrying leaflets and models for the 40k tabletop game. This was everything I loved about Space Crusade and more. More history, more fluff and more models to, well, drool over. And a well fleshed out range of models, not limited to what the board game could provide. Space crusade dissapeared to the top of the cupboard, and never came back out (well, not counting the times I accidentally pulled it out trying to get something else just right underneath the box). 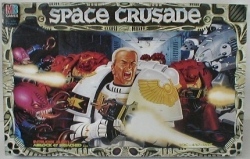 I loved Space crusade. In hindsight it was a very limited game. You only had a limited number of scenarios, with little to no maneuvering space. And playing as the “good guys” (the Space Marines), especially after the first expansion, it was next to impossible to lose. The only way would be a particularly unlucky round with the dice. But the dice heavely favoured the Marine player. The game is set up around the Space marines. In space they find derelict conglemorates of abandoned and shipwrecked spacecraft. Boarding these wrecks with a small team of marines, super engineered humans, the insides of the ship, or more accurately Hulk, is explored in a series of mission. The enemy gets control over a wide array of alines. From goblins and orcs, through to chaos marines and alien like genestealers. Unknown to the marine player, the enemy can set up his pawns with hidden counters on the board called “blips”. Only when the marine player gets line of sight will it be revealed what is actually underneath a “blip”. And from there on players take turns squaring their forces off against one another, shooting and meleeing as they go. Everything decided by a properiety set of dice courtesy of Milton Bradley (the producers of the game). Although too straight forward, it was a good game to get into tabletop gaming. I never went beyond the painting, modelling and fluff stage of full scale miniature warfare, the board game still delivered that side of the hobby in spades as well. A small trip down memory lane well deserved (and if you have a box sitting at home, I’ll play ya! ).